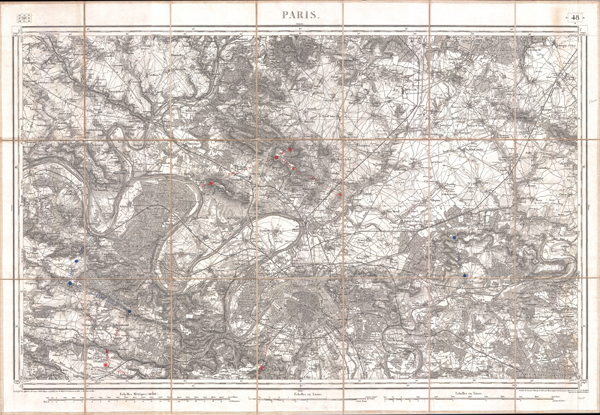 An extremely attractive mid 19th century military pocket map of Paris and its northern environs. Covers from Versailles north as far as Orry, also extends westward along the Seine to Meulan and eastward as far as Jablines. Offers extraordinary detail throughout showing gardens, forests, palaces, fortresses, chateaux, and often individual smaller buildings. Also details railroad lines. Based on a survey first completed in 1832 and updated in 1852. Though generally speaking this is a black and white map, there are several color markings in black and red ink that seem to suggest some sort of military use, but none that we can specifically identify. The Dépôt de la Guerre (fl. 1750 - 1887), active from the Revolution until the end of the 19th century was the engineering and cartographic arm of the French military. The Depot was responsible for many of the finest French topographical maps to appear in the 18th and 19th centuries. Very good condition. Dissected and mounted on linen in 21 sections. Original linen in good conditon.